Do you want to raise your profile online, growing your audience, building strong relationships with those “influencers” you hear so much about, and developing content that will continually drive more people to your website? I thought so. Today, I want to talk about one simple strategy to do just that. Okay, here it is: interview people. Even with all of my effort, two other people have ranked well for my company name just by posting interviews with me. This means that when someone looks up We Grow Media, their websites come up as relevant sources – encouraging people to venture over. The first “interview” link above is a video interview that Joel Friedlander did with me for his website TheBookDesigner.com. The second interview is one I did with Arielle Eckstut that she reposted on her website TheBookDoctors.com. Each is a simple interview format that used Skype to record the video, and YouTube to host it. 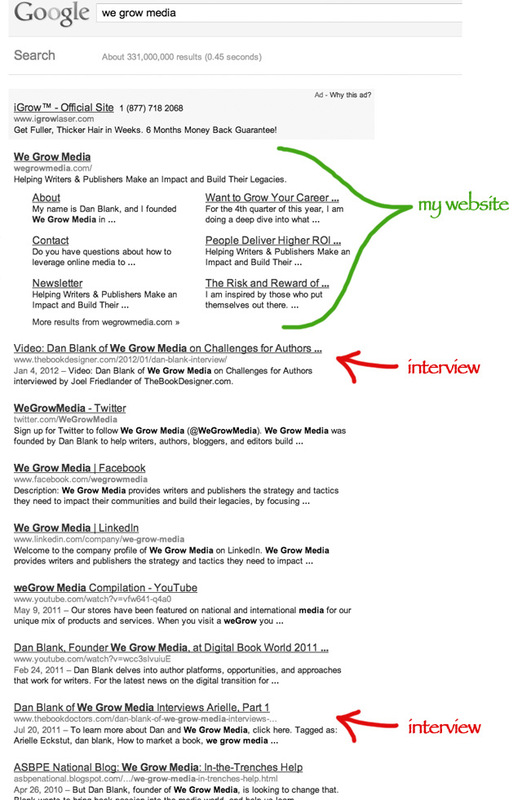 SEO value – as illustrated above, simply by posting an interview, Joel and Arielle now rank well for my company name. As I work tirelessly to build We Grow Media, they benefit more and more by those who many try to find my site, and end up on theirs. I think that is awesome – something that benefits everyone involved. Exposure to new audience – when you interview someone, they tend to tell their friends about it. Doing so exposes you to their audience in a positive and personal manner. Backlinks from social media and other websites – as the interviewee shares links to your site on social media, their own blog, and elsewhere, this builds valuable backlinks to your website from a variety of relevant sources. Be seen as a topic expert – by interviewing topic experts, you are viewed as a topic expert. Are you writing a childrens book? Interview other writers who have been down that road; interview librarians who constantly work with kids and parents and books; interview illustrators; interview teachers; interview readers! Unending source of content – tired of thinking of new content to post to your blog or website? Interviews provide fresh content that didn’t require you to write it from start to finish. But there is so much more value here beyond just “marketing” stuff. You get to promote the work of others. This is your way to be a part of a community that truly gives back. I am happy that Joel and Arielle may get more traffic because of me. Each are passionate and smart about the publishing world, something I have such respect for. By bringing others into your blog or website, you share new perspectives. This benefits your audience in so many ways. Would you go to a conference where only one person spoke for 2 days in a row? Most of the time, you go because you will hear from a dozen or two qualified people – and know you will walk away with a variety of perspectives and experiences. But perhaps the biggest reason to interview others is because of the relationships you build. I like long-form interviews, 30 minutes or 60 minutes. When you speak to someone for that long, you fall into a rhythm, you explore a variety of topics, you get to know each other. That is so powerful not just because it is a professional connection, but because this is someone who shares a passion for the same thing you do. If you want to learn exactly how I do video interviews, check out this article I wrote: How to Record and Online Video Interview.